Cordings is a rather special shop. Not for its history, which I know others would focus on, but for its consistent philosophy of quality materials and practical construction. This is not a luxury retailer. The knitwear is of lambswool, not cashmere. Most of the silks are digitally rather than screen printed. In fact the artisan crafts we celebrate here at Permanent Style are largely absent. The same goes for fits. Where we discuss bespoke shirtmaking and slim-line knitwear, Cordings specialises in boxy Tattersall-checked shirts and generous sweaters. The raincoats have plenty of room to move; it’s no surprise Loden coats are a perennial favourite. But it’s all designed with practicality in mind. The shirts are comfortable, and don’t un-tuck no matter how much you twist to fire your gun. The coats, equally, offer the ability to load up pockets with all the necessities of a day out on the estate. And while the niceties of screen printing are not top of the priority list, materials are very important elsewhere. The corduroys (from Brisbane Moss cord) have heavy, canvas pocket linings. The covert coats, for which Cordings is famous, use a proprietary Fox Brothers cloth. Raincoats are made by Thomas Hancock (same bonding/gluing process as Mackintosh). The Tattersall shirting is unusual, with part of the range being an 80/20 cotton/wool mix, where most are one or the other. Harris tweed is everywhere – for its durability, its range of colours, and its small runs. In fact, small runs are important in everything, given the breadth of the range and small size of the shop. Perhaps the crowning glory when it comes to cloth, however, is the keeper’s tweed. As far as I know Cordings is the only company in London to carry ready-to-wear jackets in keeper’s tweed – the covert-like 28-ounce wool built to stand up to thorns, rocks, and anything else the countryside can throw at it. As you might expect, the Cordings stock and cut changes little between seasons. 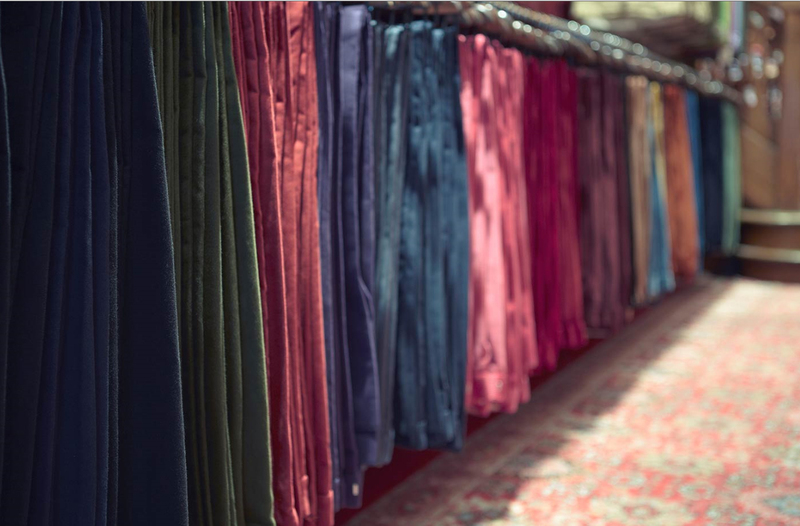 The corduroys are the same weight and the same width, allowing it to carry 20 colours in them (above). It’s the kind of shop where men go because they know they can buy the same thing year after year, and repair or replace much-loved items. There is, of course, much to explore in the store and the history. Founded in 1839, the address and store front dates back to the 1877. 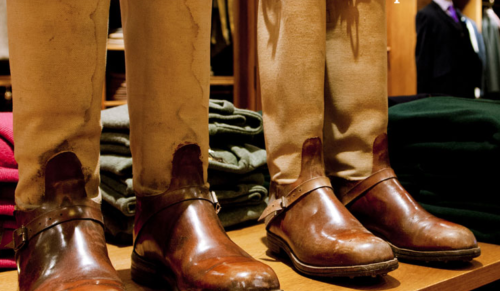 Back then it had tailors and bootmakers on site, and the archive pieces around the store (below) are Cordings originals rather than (as in other stores) random boots acquired at junk shops. Cordings is much loved, and deservedly so. I don’t shop there, but I admire its attitude and I hope it never has to change. You can follow the discussion on Cordings: quality and integrity, if not luxury by entering your email address in the box below. You will then receive an email every time a new comment is added. These will also contain a link to a page where you can stop the alerts, and remove all of your related data from the site. I have a few things from Cordings, mainly for shooting or walking and I love them. Shopping there is always a treat, for all the reasons you describe. I’m the only one in my draughty office today and my chunky Cording’s cardy is the ideal garment – warm and comfortable, like an old labrador. I really appreciate reading something about Cordings here, they are a true gem and personal favorite of mine. Their Corduroy trouseres are superbly crafted and the Chinos are execellent aswell. The best about them, like you said, is the continuity of their stock. I love that they dont change the fit, no going with trends and the assurance that you get the same perfect trousers in the same colourways year after year. Cordings really is the epitome of classic country style. Lovely photo at the top, Simon. I’m really glad you’re covering Cordings. 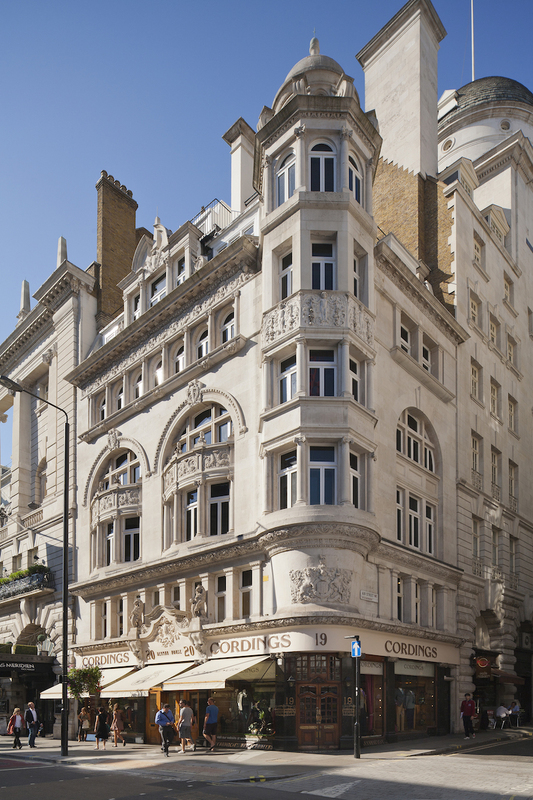 There is too much emphasis on ‘luxury’ in London’s West End. I’m not impressed by cashmere. Wool is easily the better all-round cloth. Any tailor would agree. I often struggle to find well-made woolen knitwear. All socks are Merino these days but Merino, though soft, doesn’t last long! (£24 a pair in Jermyn St). I’m personally tired of ‘luxury’. Companies like Cordings, as you say, have integrity and quality. It’s a pity there aren’t more in the West End. Love the picture of the trousers above. It’s so strange that everyone is currently equating slim fit with being ‘fashionable’ – slim is about to go out, indeed if it hasn’t already in high fashion, and ‘oversized’ and loose trousers are coming back ‘in’. Example = Armani was always typically oversized in the 80s and was high fashion. So Cordings looser offering may well fit people’s expectations of how a garment ‘should’ fit within a year or so. Slim fit is perhaps a term for which we are speaking about different matters. If I don’t buy slim fit shirts, I have a tent, balloon – impossible! Cordings heavy cord trousers are not so wide in the thigh and large in the seat, but the side adjusters and waist is a delicate question. The chinos and the heavy cords have such colours I buy them. But a tiny percentage elastic would improve the cloth. I wish for new colours like duck egg, teal, turquoise, etc. My question to Simon, who isn’t a tailor, but has so much experience, is what he thinks about the Cording jacket shape? I’ve only seen photographs, but some of the models look far too wide in the shoulder breadth – presumably padded extremely? Somehow the shape is suspicious? Is it like the heavy cord trousers quite a question of one’s figure? I think New & Lingwood has an excellent shape, despite two buttons instead of one. Cordings has mostly single vent, another question? The ticket pocket clutters! What about Keepers Tweed lightweight – is 14 ounce light? I’m hypnotized by wool-linen or maybe wool-silk in spring jacket cloths – is that a mistake? Cording´s cotton flanell shirts are the only ones I can wear during the (cold nordic) winter. Most poplin shirts become too itchy. Yes, praise Eric Clapton! I also praise Hillary Becque and the girls because they are nice. My impression is Cordings has a human quality. I have some corduroy flat caps from the range, in colours that most readers would probably not appreciate! A gem of a shope. Amid the frenzy of fashion and faux, PR-agency “heritage”, Codings are the real thing. I have a Harris Tweed jacket in light brown ‘Donegal’ pattern fabric that is both durable and soft as a pair of pajamas. Lovely shop. A few years ago Jack Wills took a standard ladies navy covert coat from Cordings, put a snazzy lining in, and charged about 200 quid more for it. And people bought them!! Come on now. The materials may be great but the cuts and styling are awful – boxy, flappy, inelegant. And the service is a bit snooty too. Happy new year to you and PS readers! I greatly appreciated your 2014 posts, even those that were focused on high end bespoke items! As to Cordings, I only remember having once watched Eric Clapton speaking about the shop. I think it’s a very good idea indeed from time to time to introduce to these kinds of shops too, which are menswear institutions on their own striving to remain true to themselves despite changing circumstances. The course taken by PS over the past years is the right one. It’s truely amazing how much this blog has slowly but steadily contributed to shape our sense of style and our understanding menswear! It could be, for instance, interesting to see pics of guys before and after starting PS! For sure, the time you also take to reply to queries makes a big difference! Shirts / jackets don’t have to be baggy to be comfortable, all you need is a high cut arm hole. Actually a better fitted garment is often more comfortable than an oversized one. So true on the comment about “cashmere” above. I’ve been a John smedley man pretty much all my adult life and therefore assumed all high end knitwear performed in a similar manner. I was shocked when I got my first cashmere jumper from a ‘luxury brand’ a few weeks back and washed it once on 30 degree ‘wool cycle’ with the appropriate detergents. It shrank loads and was bobbled to death. Also, prior to that, it felt far too delicate in any case. Like it was about to rip every time I put it on and off. I’m sure you are Simon, just wanted to point it out as quite often men go for oversized garments in their chase of ‘movement freedom’. Great posting! I visit Cordings a few times and it is an absolute pleasure looking at their clothing products. I have an unrelated question though. As many readers here, I have been an enthusiast of bespoke clothing for some time now. I wonder if it is possible for a lay person like me to learn tailoring techniques (I know how to use a needle and thread and do minor repairs or fastening buttons and that’s it) through reading related books? If that’s at all possible, would you have any books to recommend as a starter guide for sewing and pattern making? I would be grateful if you could shed me some light on this. You can learn some advanced tailoring, enabling things such as adjustments (side seams, trouser waist) but not cutting and fitting, which requires a lot of experience. I can’t recommend any books on the former I’m afraid though – it’s not something I’ve ever tried to learn. I like the concept of Cordings but cant get their clothing to work for me. I am 6’1 and fairly slim typical build (34″ waist and 39 chest”). 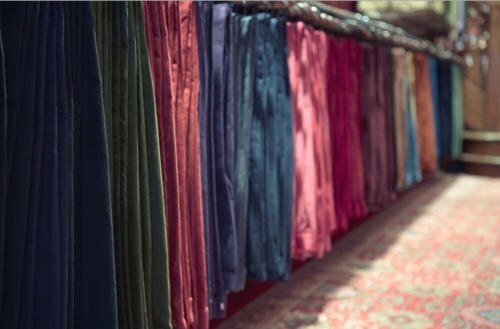 Their cords are great weight with a fantastic range of colours, but have a tiny rise (its a 10″ rise which is what you find in fashion cut jeans). How bigger middle aged men make these work I just don’t know. These are not a ‘traditional cut’ as most suggest or choose to believe. Their tweed jackets are very boxy as well, especially though the stomach and chest they are wide cut. Look closely on the marketing images and you can see this for yourself. This may work well though for the more portly gentlemen who probably represent much of their customer base these days. In terms of construction, they might have some fancy details, like nicely thought out pockets or linings, but unfortunately construction is constrained by their prices so its all fused canvassing used their tailoring. You get what you pay for in this regard although I would suggest cheaper and equivalent alternatives from people like Magee whom I suspect they order at least some of their stuff from (Donegal overcoat comes to mind). History and heritage are fantastic though .. although remember they have gone through the washer and are totally reliant on third parties to make all their things for them now. Therefore much of what that heritage was built on is quite frankly dead, which is a shame, they don’t actually make anything there or have any real tailoring expertise at all (I would probably argue that many tailors on the row don’t have much expertise either nowadays … the good tailors are dead or on their last legs). As such you are buying into a mirage of a traditional gentlemens country / hunting outfitters … they have got artificial life support as the free market would have wiped them out years ago. Hi Rups, I’m not sure Cordings claim to be tailors. I think their clothes are cut for comfort and practicality and aren’t really aimed at guys who wear skinny jeans! Regarding your comment on Savile Row, if you’re careful where you go, you’ll essentially get the same quality as ever. I recently re-lined a 1962 Huntsman coat for someone. It was constructed exactly the same inside, albeit with more use of wadding than you tend to see today (which may have been an idiosyncrasy of that particular cutter). As always, some tailors are better than others. Simon’s blog has lots of examples of modern SR fit and construction for you to see. May I just concur with your reference to Magee, their jackets are not perhaps quite up to the standard of make they had when they were made in Ballymena but their Donegal woven tweeds are great. Their overcoats are a real feature and modestly priced. they may not be luxury as we think of it when reading PS but outside of London they are one of those companies that still produces somehting different and worthwhile. I’m building a classic wardrobe and I would like to start wearing odd jackets and smarter trousers more often but unfortunately I realized I would be overdressed in every setting I go. I work in an office where everybody dress very casually and even the boss wear a shirt and chinos. During the weekends all my friends wear tshirts and baggy jeans or cargo pants. I would be overdressed even in a oxford shirt and chinos. So I’m starting to questioning if it is worth to build a classic wardrobe when it is obviously impractical for my needs. Should I just conform to the others and forget wearing jackets or should I just “ignore” how the others dress and just wear what I like? Just for reference I’m 25 years old. In my purely PERSONAL opinion, you should wear clothes YOU like, not try to conform (within reason…), as long as they are actually what you like. Clothes are nice but, essentially, a superficial element. I don’t think there is any reason not to have a little fun. Sogno, I can definitely sympathize with your dilemma (as I’ve lived it myself) and it’s one a lot of men in the dress-down office face. Part of dressing well is dressing appropriately to the situation you are in, so you don’t want to stand out too much, and yet general sartorial slubbiness shouldn’t mean everybody should have to conform to the same mediocre outfits. Firstly, is your question specifically about jackets or classic menswear in general? If it’s the latter, there are lots of classic components you can start to integrate into your everyday dress without looking inappropriate (Simon has written lots of good advice on this) such as a good quality pair of chukkas or chelsea boots that will look great with jeans and improve your whole outfit. Similarly you can switch out jeans/chinos for grey flannels and upgrade your knitwear to Smedley cardigans, etc. that look more like a jacket. As for jackets, my own experience was that, once I’d done all of the above, it was surprisingly easy to start introducing the occasional odd jacket (casual Neapolitan style, in tweed, cotton or cashmere) over jeans, without attracting too much attention and/or looking inappropriate. It’s amazing how quickly people adapt to the idea that you are a “smart dresser” if you introduce it gradually and in stages. Hope that helps; trust me, it’s well worth sticking with it! I think this January 2015 article fairly takes the measure of the London shop, where I’ve bought a variety of garments over the years, including a suit and some knitwear this January. I have yet to see the newer Harrogate shop but think it’s likely to appeal to my equally quality and value-obsessed fellow tykes. However the dstinctiveness of the business’s ethos and practice would justify a longer piece even on a site whose visitors may mostly have yet to sample its pleasures. In the magical place called Piccadilly and Mayfair there a few great shops I have grown to love and trust over the past 25 years. Places like Gieves & Hawkes, Harvie & Hudson shirts and Church’s Shoes to name a select few. It’s not just the product and service but the sense of tradition and timelessness that make then so special. Until recently Cordings of Piccadilly would certainly be included in that select few. Over the years I’ve purchased many great articles of clothing from them for myself and also as gifts for friends and family. Sadly my last purchase was a safari style jacket that looked great in the store but started to ‘decompose’ after being worn just a few times. The stitching was the first to go, followed by the ‘leather’ strip at the back for hanging the jacket – it was actually plastic and I was later informed later just a style feature and not to be used. Also the internal lining bunched up which completely changed the look of the garment. When I returned it to the store, I was informed that it had been made for them by an Italian supplier which was interested as their logo is – Make It British! They did offer to repair all the faults but I made it clear that as it was such a low quality garment, I really did not want to wear it again and requested a refund or credit note. I got a call a week later and spoke to the store manager who informed me that the jacket had been ‘repaired’. When I explained again why I felt this was not satisfactory, he refused to discuss this any further, told me he was very busy and then put the phone down on me. Cordings, you may have been established since 1839 but you have destroyed your reputation with me in less than a week – congratulations. Great review. Cordings is a world unto itself and you either go with it, or you don’t. Some lines will suit others won’t but unless you’re an acolyte, that’s true of any establishment. As for the staff, those in the men’s department, with their patronising tone to those of us without standard RP, is like something out of the dark ages. It’s also the ‘tell’ that Cordings isn’t as classy as it perceives itself. Good clobber though. I visited Cordings for the first time a few days ago. I was surprised by how small the shop is and how narrow the range of garments on display was. It was fun and quirky, however, I find their website much more useful. Dear Simon, your remark: “keeper’s tweed covert like” is a provocation! Is covert cloth 28 ounces? Why is keeper’s tweed like covert cloth? Keeper’s tweed is cloth for coats? Do you mean the colour, weave, or ? Peter, would you mind also using your name in that section of the comment when you post, rather than a subject, like ‘Provoked’? Simon, I apologize for not usng my name. I believed if I use my name it would appear too often because sometimes I ask lots of questions. I like my name but I’m embarassed to be frequent questioner. My questions are not fake. I have a N&L covert coat, in fawn, which is still intact (not its lining). My N&L car coat (patterned like a Barbour jacket) of gabardine has gradually more threads unravelling. Hillary at Cordings recommended I buy a keeper’s tweed JACKET, which she called a Beast, after I complained to her how disco sweat ruins Fox lightweight flannel (and now wool-silk mix) and Filson rucksack leather straps rub through Noble wool/cashmere and lining. Hillary claimed Cordings’ kepper’s tweed is indestructible. So why not a Keeper’s Tweed COAT? I am very glad to know this shop. I’m long time British fan from far east though, I’ happy to be a customer of this traditional gentlemen shop. I ‘m impressed deeply to read its tradition and it’s powerful enough for me to let me back to traditional British world once again. Even after back to Japan I’ll be your customer and keep making good purchase by global shipping.